Much talk was in German media on the release of "Die Reise ins Glück" (better known to international audiences as "Journey into Bliss"). Unluckiely this did not show in terms of admissions, which is a really sad thing, as director/writer/producer/etc. Wenzel Storch invested pretty much everything he had into this production. He is probably ruined for life, which would mean that this will be his last movie ever. In the nineties, Wenzel Storch was THE most celebrated star of German underground cinema who had then just released "Sommer der Liebe", which became the highest grossing movie shot on Super 8 ever (well, at least in Germany). Then it got rather quiet around him. From time to time there were news popping up that he was working on something new, but years went by without anything released. Wenzel and his friends went out of money again and again, the rumor even was they called it quits and canceled the whole project, until they somehow completed it in spring '04, after 12 (!) years in the making. I was lucky enough to attend the world premiere here in Bochum at the German Psychotronic Film Festival in June 2004. To make it short, "Die Reise ins Glück" is a film you either love or hate, with very few shades possible between those extremes. I consider it one of the most beautiful things I've ever witnessed and have seen it four times by now, but I know that there are people who would walk out of it or even yell vicious curses against the screen (I'm not joking here!). The story: Captain Gustav traveled the seven seas for years, but now he, his crew (consisting of some frogs, an owl, a rabbit, a bear and several other animals) and of course his living snail-ship want to retire. They stop at a beautiful island – only to find out that it is inhibited by Knuffi, an old enemy of the captain. In Gustav's absence, Knuffi went for a career as an evil King and now does what all really evil kings do: he kidnaps the captain's children. Gustav has to go on a final mission to free his kids and stop the mad dictator. Okay, you probably see where this is going: "Reise" is basically a fairytale on psychedelic drugs with an anarchic and very anti-fascist attitude that clearly reveals the director's punk background. But after all, the story is not that important. This is a movie that is neither character nor plot driven, it is the atmosphere which keeps one totally stunned. Everything in this movie was hand made, from the strategically placed, cute stop-motion sequences to the superb art direction. Open up your eyes wide! In a righteous world, the sets, costumes and props would make this movie a certain nominee for an academy award. Storch delivers a bizarre, postmodern mix of a dream-like fairground and glittering Christmas elements, much too reflexive to be kitsch – every set has it's very own colour scheme and predominant material. It is incredibly beautiful to look at, from Gustav's snail-ship to Knuffi's golden palace, and you will find something new every time you watch it. This fits with the brilliant dialog, something you'll never quiet get if you are not a native speaker. Just like Storch found much of the material for the sets in torn down factories or on disposal sites, big parts of the dialog consist of old-fashioned teenager slang from the seventies and eighties, which is somehow still in our collective mind, just waiting for Storch to pull it out and make use of it. Although the movie's overall tone is very sweet and uplifting, Storch does not spare out the dark side of fairy tales. There are some pretty hefty splatter scenes and make-up effects, which made me shake my head on the bigotry of the German film censorship board who have cut almost every horror movie known to mankind, but gave this one a "not under 12" – rating, meaning every 6 year old with a parent can watch it. And this is definitely not the only border the film crosses. Wenzel Storch (who, by the way, turned out to be an extremely nice, sympathetic guy when I talked to him) gives you smoking kids, gallons of vomit and sperm, kids being peed onto, horny grandmas, a literal brain wash and other quite somatic moments, so be warned if you don't dig stuff like this. But if you are willing to confront yourself with something really unique, go for it! No matter if you love or hate it, it is an experience like nothing else. 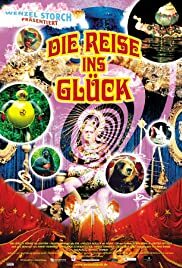 "Die Reise ins Glück" is a trip beyond the rational, a bizarre, postmodern mish-mash of "Alice in Wonderland" and the comic book classic "Little Nemo", a phantasmagoria which seems to come directly from another world – sweet, surreal and completely psychedelic.